Who forgot the person she borrowed it from. Without regret for projects left unfinished. To dream of the place where it was treasured. To lift it out of the dark into the open. wish these photos were sharper! I was annoyed when I looked these poorly-taken photos. Between my efforts to poem-elf quickly and inconspicuously, and my use of a borrowed camera, the pictures are out of focus. In these days of automatic focus point-and-shoot digital cameras, bad pictures are pretty much inexcusable. But the truth is that a blurry picture more accurately represents my understanding of this poem than a sharply focused one. Because this poem puzzles me. The conversational tone and comical worry over a punch bowl (something Monte Python-ish about worrying over punch bowls) are deceptive: this poem is as complicated to me as one of Donne’s metaphysical conceits. I’ve read “Friendly” dozens of times and I’m still asking, What’s going on here? What’s it all about? . . .Alfie. . . When you sort it out, Alfie? Are we meant to take more than receive? Or are we meant to be kind?. . .
Oh that Burt Bacharach. He has a long-standing habit of intruding in my thoughts when I’m feeling vague and lost. To move beyond my frustration with the poem, I decided to work methodically, charting the action from beginning to end. That’s when I realized that the action of the poem, like the action in a good story, begins before the poem does: the punch bowl is missing and the owner, let’s call him Alfie, is upset. (We assume Alfie is upset from the speaker’s need to present an alternative, friendly, explanation for the missing punch bowl.) Alfie must have jumped to unfriendly conclusions. Where’s the damn punchbowl? I imagine him shouting. Did some crazed lover of punch bowls steal it, or did someone borrow it and break it? Wait, says the speaker, if we assume good intentions, there’s a more charitable explanation. And then from this base of the speaker’s empathic imagination, the poem launches forth. He creates a cast of characters, each acting with implied charity. Alfie, the owner of the missing punch bowl, is a good friend, the type of friend you turn to when you’re in over your head hosting a party. The man he loaned the bowl to is overset by circumstance, a lost job, illness, possible death, but he has also, helpfully, lent the punch bowl to another friend, a woman who hosts charity balls. Then the poem returns to Alfie. Alfie has been left with another serving piece, a cut glass plate, from one of his parties. The speaker suggests he makes a gift of it to a guest. With all the glass sitting around, Alfie can’t throw stones: that is, he can’t be upset about someone keeping his punch bowl when he has kept someone’s glass plate. Is the poem, then, a meditation on loaning and returning, giving and receiving? In the world of the poem, objects move around from person to person, creating an endless flow of connections between friends and strangers. Is the message of the poem Pay it forward? Anytime a poem is reduced to a slogan something is amiss. So I turned from the characters to examine the objects that pass between them. Both the punch bowl and the cut glass plate are celebratory and communal objects. A punch bowl is used on special occasions—a baby shower, an anniversary party, gatherings in school gymnasiums—and has a sentimental air of a world that is gone, a friendlier, less self-absorbed world with less emphasis on individual choice, on getting exactly what we want. We don’t use a punch bowl when drinks are made to order. A punch bowl’s almost like a communion cup, the line forming, everyone consuming from the same source. The cut glass plate is also used on special occasions, for serving appetizers or little desserts, a fancy way to display any food to be passed or set on the buffet table. As befits communal objects, the bowl and the plate are transferred among the characters of the poem, creating sort of a Brotherhood of the Traveling Serving Pieces. Or they would if they weren’t orphaned, stored away and unused. And then we see that the speaker’s empathy extends even to these objects. We are asked to consider their feelings: the punch bowl left alone in a basement, the plate dreaming of its original owner, a crystal Velveteen Rabbit. So I let it go. I left the library without “getting” the poem. But the funny thing was that while I should have felt dissatisfied, my mood was instead elevated. I walked through a misty rain in the library parking lot feeling goodwill towards everyone. I felt almost as a spirit, floating around, mildly euphoric and gentle. It was lovely. All that time spent with the empathic speaker had moved me temporarily into another realm. 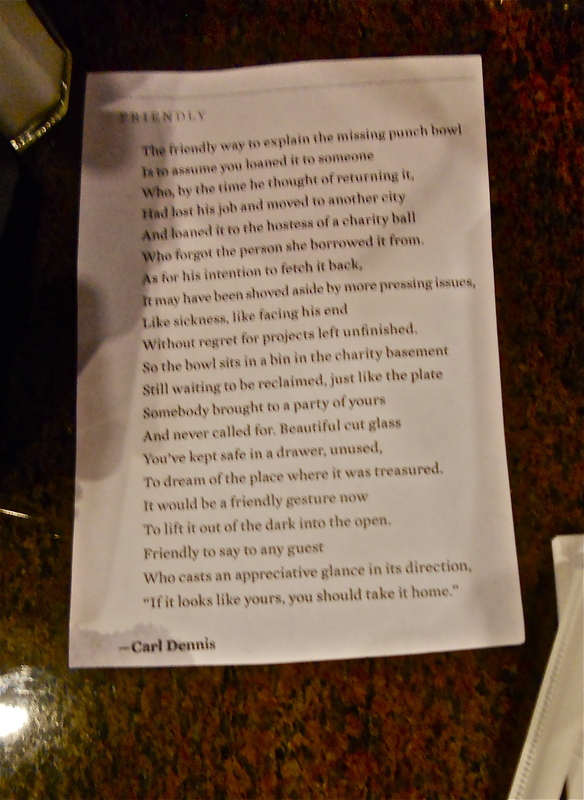 “Friendly” seemed like a good poem to leave at a new diner near my house one morning when I was having breakfast with my husband and some friends. While there I saw my neighbor with her soldier son just home from Afghanistan; the friends we ate with knew the manager and talked with her; and on the way out we visited with two men we hadn’t seen in months. They were cute in their booth, catching up with each other. 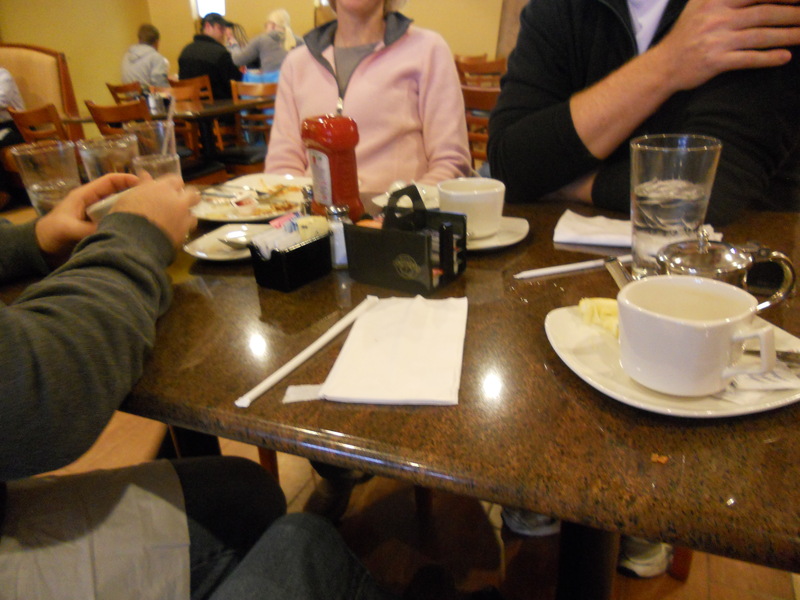 Friendliness was as much in the air as coffee fumes. Carl Dennis is a Midwesterner by birth, born in Missouri, schooled in Ohio, Illinois and Minnesota. He’s lived on both coasts, but seems to have retained that friendly Midwestern sensibility. He teaches now at SUNY in Buffalo. In 2002 he won the Pulitzer Prize for poetry, and has also won, among other awards, the Lilly Poetry Prize. Poetry is useful in that it allows readers to feel that they are not alone, that others have thought and felt as they have. It can do this more powerfully than any other kind of writing, or at least more directly, because in a good poem we are made to feel that we are in the presence of a whole human being speaking to us directly, or providing a script for us to enter as we see fit.